Facial eczema can be difficult to live with. It can be stressful. It can be more noticeable, making the sufferer self conscious. Stress can then make the symptoms worse, becoming more inflamed and itchy. There are ways you can manage and treat it, to improve its condition, and feel better about it. Some areas on your face are more sensitive than others. And some areas are more likely to come into contact with allergens and irritants. This will increase the chance of a flare up occurring. You are more prone to eczema on the face if you have had a history of atopic eczema, or any of the other atopic diseases, asthma and hay fever. It can be triggered by an allergen or irritant. Including the weather, cosmetic products and food. Your face is exposed to all the nasties in your environment. Some you can avoid. Some are difficult to. Prevention is the best way to look after your skin and manage your eczema. 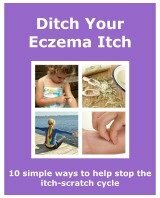 There are a number of things you can do, to treat and manage your eczema. When the eczema is mild or moderate there are some first-line treatments that can be used. Using topical corticosteroids on the face is not usually recommended. Only use if you have been advised to by your doctor. They can then monitor usage, and how effective it is treating your eczema. There are a couple of non-steroid options that may also be prescribed if other treatments are not effective. Though not all doctors will prescribe them. 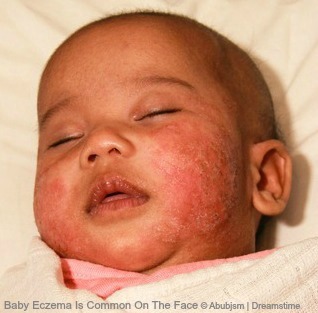 If you have seborrhoeic eczema, then there are other ways to treat it. You can find out more about them, here. As a child I had the tale tell eczema sign, 'The Blackcurrant Smile', I call it. I had eczema at the sides of my mouth mainly. It was brought on by what I ate and drank. Orange juice was an irritant. When I had the symptoms, even after consuming the offending foods, they could be stubborn to manage and treat. That was around 35 years ago. There was not the information around then, that there is now. It was common for a topical corticosteroid to be prescribed for facial eczema. I remember having facial eczema for most of my childhood, in differing severities. At 15, I had my worst bout of facial eczema. My face was covered. It was a horrible age to deal with it. It was red and painful, and you couldn’t miss it! I’m not sure how long it was that bad for, but I remember that it started clearing while I was on holiday. I had been swimming during the day, and that night my skin became very tight. It felt like I was wearing a face mask. From then, it improved. I was never sure why. I have only been able to come up two reasons. One, something in the swimming pool, which i am not convinced of. Two, I was away from school, which I hated, and was picked on for a few reasons. Perhaps being away from the stress of that environment helped. Luckily it has never been as severe on my face since then. There is more information available and professionals seem to be more knowledgeable. I constantly use an emollient. I haven’t used soap for many years. I have never worn make-up. I was told by a doctor when I was young, not to. Though I know that some eczema sufferers wear some make-up. There are some products that maybe suitable. I just choose not to. I like my skin to be able to breathe. It is a personal choice. If you decide to use cosmetics, then patch test them first. If there is no adverse reaction within 24/48 hours, then you can decide whether to use them. I would recommend that you wipe any make-up off at night. And go barefaced, or wear minimal make-up for some days.